Arachniodes henryi (Christ) Ching, Acta Bot. Sin. 10: 258. 1962; Tagawa & K.Iwats., Acta Phytotax. Geobot. 26: 58. 1974; Tagawa & K.Iwats., Fl. Thailand 3: 342, f. 30.7-8. 1988; Boonkerd & Pollawatn, Pterid. Thailand: 199. 2000. 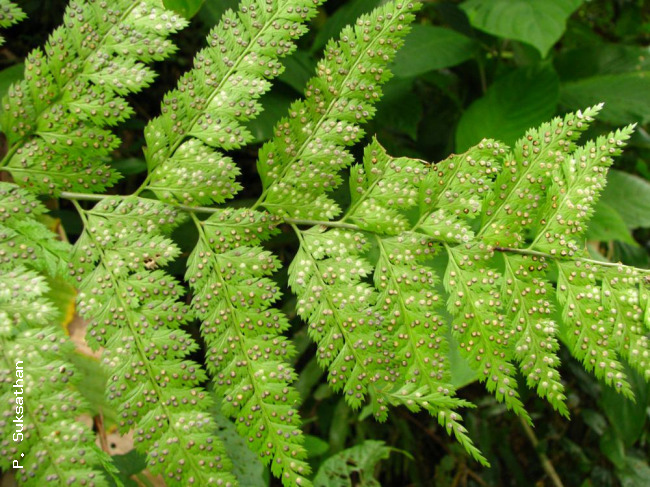 – Polystichum henryi Christ in Lee., Notul. Syst. 1: 36. 1909. 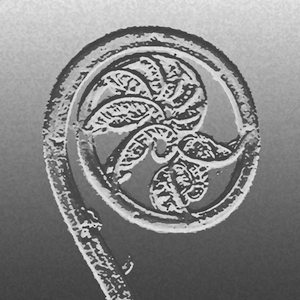 – Dryopteris henryi C.Chr., Contr. U.S. Natl. Herb. 26. 282. 1931. – Rumohra henryi (Christ) Ching, Sinensia 5: 57, t. 10. 1934. – Byrsopteris henryi (Christ) Morton, Amer. Fern J. 50: 154. 1960. – Type: Henry 13351 (Isotype in K), China, Yunnan. Rumohra simulans Ching, Sinensia 5: 54, pl. 8. 1934; Tardieu & C.Chr., Fl. Indo-Chine 7(2): 326. 1941; Holttum, Dansk Bot. Ark. 20: 31. 1961. – Arachniodes simulans (Ching) Ching, Acta Bot. Sin. 10: 259. 1962; Tagawa & K.Iwats., SouthE. Asian Stud. 5: 93. 1967. – Type: Fang 2742, China, Sichuan. Terrestrial. Rhizome creeping, up to 8 mm diam., scales dense, linear-subtriangular, up to 7 by 1.5 mm, brown. Stipes stramineous, scaly at base, very sparsely, minutely scaly upwards, up to 50(–75) cm long. Laminae oblong to pentagonal, with caudate-acuminate apex, 4–5-pinnate, up to 83 by 75 cm; rachis glabrescent, grooved; pinnae anadromous, about 10 pairs, the lowest the largest, with large, basal, acroscopic pinnule, middle ones oblong-subtriangular, widest at distinctly stalked base, gradually narrowing towards acuminate apex, up to 38 by 13.5 cm, upper pinnae rather suddenly reduced to form apical part of frond, pinnules oblong-subdeltoid, acute at apex, unequally cuneate at base, stalked, 4–10 by up to 4 cm; secondary pinnules oblong-subdeltoid, moderately acute at apex, unequally cuneate at base, pinnatisect to pinnate, segments oblong, oblique, sessile, serrate at margin, lobed in larger ones; papyraceous, green, glabrous on both surfaces or sparsely hairy on veins underneath. Sori round, terminal or more rarely dorsal on veinlets, medial or close to margin, raised on upper surface; indusia round-reniform, glabrous . NORTHERN: Mae Hong Son, Chiang Mai, Chiang Rai, Lamphun, Lampang. SW China (Szechuan, Yunnan, Hupeh), Upper Burma and N Vietnam. On mountain slopes usually in dense evergreen forests at 800-1400 m alt. Middleton et al. 4963, Mae Hong Son, Ban Hua Ha (E).